If remodeling your kitchen could be compared to baking, then the kitchen countertop is the proverbial icing on the cake. Technically, the "greenest" countertop is the one you already have if you can refurbish it. If your current counter is a lost cause, consider installing one of these eco-friendly kitchen countertops. Instead of natural stone, try recycled glass slab countertops. Granite and marble countertops are among the most desirable, but quarrying natural stone depletes the earth's resources. Engineered stone became popular for emulating this luxurious look, though its manufacturing process isn't very eco-friendly either. Concrete counters can be green if the aggregate is recycled, but some find the look too austere. Instead of laminate, try paper composite countertops. Everyone has lived in a house or apartment with Formica laminate countertops. Laminate sure is cheap, but it has a stigma attached to it, and for good reason: the resins used to make it contain formaldehyde, which can off-gas and compromise the air quality in your home. ​​Paper composite counters offer the same durability without all the icky chemicals. By impregnating post-consumer recycled paper with a small amount of resin, the result is a waterproof and heat resistant counter. Instead of butcher block, try FSC certified wood, bamboo vanities or reclaimed wood countertops. There's no arguing that wood counters make a kitchen look warm and inviting. It's a natural material, but it takes years and years to grow hardwood trees large enough to harvest. If your counters are made from wood certified by the Forest Stewardship Council (FSC), you can rest assured it was not the product of clear-cutting. Choose woods that are native to your region to cut down on transportation. Bamboo, a rapidly renewable resource, is another eco-friendly alternative, but the greenest wood countertop of all is reclaimed wood. 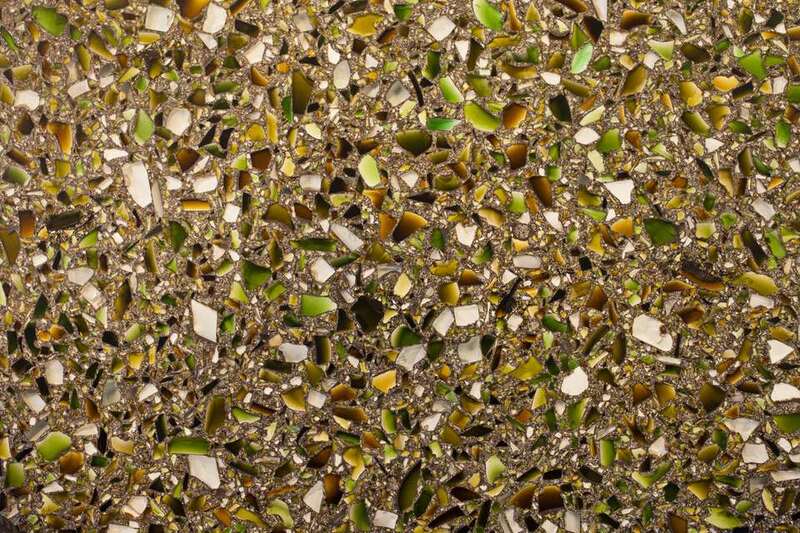 Instead of ceramic tile, try recycled glass tile. Ceramic tile is the material of choice for budget-conscious remodelers, but it's only green if its made from recycled content, and that usually only accounts for a small percentage. Glass tiles can be made from a much higher percentage of recycled materials up to 100% and after the fact, it's easier to recycle glass than ceramics, consuming a lot less energy in the manufacturing process. These tiles are a durable, affordable and attractive alternative-available in a wide range of colors and customized formats-to ceramics, which tend to chip and crack. Keep in mind that glass tiles are susceptible to scratches, and some manufacturers do caution against using them for countertops. At the very least, glass tiles make for beautiful backsplashes. Instead of stainless steel, try recycled aluminum. If you want a very modern kitchen or one that is fit for an iron chef, give recycled aluminum counters a try. Look for counters that contain around 50% to 60% recycled material. Mining metal creates a lot of pollution, so choosing recycled aluminum is definitely an eco-friendly countertop option.